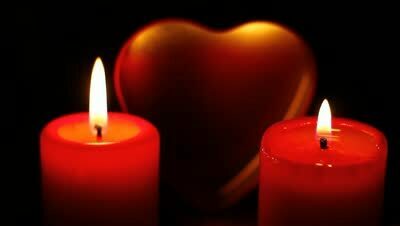 Anoint two red candles with rose essential oil, then place them on your Altar on each end as far apart as space allows. On a Friday, the day of the week devoted to the Goddess Aphrodite write your name on one candle (the one on the left side of your Altar), then carve "Beloved", True Love, or Soul Mate on the other candle. On a piece of parchment paper write all the attributes you would wish for in your perfect true love. Try to use language that will ensure positive magick, and try to be specific. If you simply write "handsome" you may well end up with someone gorgeous, but who is harmful for you in some other way. Place the parchment in the very center of your Altar. Each evening at seven, carve a word of special significance on each candle, such as "devoted" or "kind". Move the candles slightly closer together then light them. Take some time to think about this quality for several minutes, then snuff out the candles. Repeat this for seven nights, using a different quality each time, until on the seventh, the following Friday, both candles are finally standing as close together as possible, in the center of your Altar with the parchment directly underneath them. After a moment, pick up the parchment and light it from the flame of both candles. Drop it in a fire proof vessel such as a cauldron or metal dish. Light the candles for a final time, and let them burn down and out. If any wax remains, scatter it before you as you walk through a beautiful place, wishing it to bring good fortune to others hoping for love.